Chasing Nonconformity is finally taking shape! As you may know, I’ve been working on the sequel to Imminent Danger for a while now. I believe I started it back in … 2010? Possibly earlier. Anyway, it’s been quite the laborious process. I’ve never written a sequel before, so there was a lot of stumbling and self-doubt and re-writing (the current version is almost indistinguishable from the original draft) and … yeah. You get the picture! Anyway, I’m pleased to announce that things are finally taking shape with the sequel. I’ve settled on how I want events to happen, I figured out Varrin’s motivation (he had one before, but it was kind of a stupid motivation, so that’s changed), and I flexed my mediocre organizational muscles and did up a chapter-by-chapter breakdown of what the heck is going on in the story. I even made a timeline! Guys, I’m so psyched right now. You know that point where everything just starts to come together, and you kind of sit back and go: “Wow. This feels amazing. And I can’t believe it took so freaking long to get to this point.” And then you ask yourself if all the hours of writing and re-writing and agonizing and plotting and arguing with your brother who absolutely refuses to entertain the possibility that maybe characters don’t have to make logical decisions all the time were worth it. The answer is yes — yes, it was worth it! There’s still a heckuva long way to go before Chasing Nonconformity is ready for publication (obviously!). Part of my plan calls for new scenes, which need to be written. And then other scenes have been completely flipped around to be from a different character’s POV, or the same events happen but in a different location, etc. It’s going to be an epic re-write, that’s for sure. But now I have my lovely, color-coded chapter breakdown to guide me, so I’m confident it will turn out more or less the way I envisioned it. Realistically I see this book being published no sooner than Fall 2014. Cease your tears, my friends! The novel-writing process is not for the weak-hearted. We must stand together or we will surely perish! Right. Thanks for reading! Remember to enter my Goodreads Giveaway for a signed copy of Imminent Danger And How to Fly Straight into It! 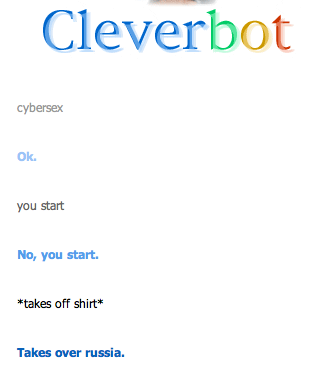 Note: Cleverbot’s responses are in blue. Sounds like a busy, but smart plan. Good luck. What do you do when waiting for the drafts to return? Well, that’s pretty much the first time anyone’s ever called one of my plans smart, so thanks 😀 I’m generally terrible at planning, hence why I’m so pleased with my current state of being insanely organized and on the ball. That marathoning a TV series sounds like a great idea. New ideas can come from that, so you can call it work. I totally can relate to this. Same boat we’re floating in, my friend! It is ridiculous exciting when you realize all the pieces and how you want them to click together. Then all you want to do is leave, breathe, and sleep what’s buzzing in your head. Glad you are at this stage! Congrats! Thanks! And it’s come at a really good time, because with the upcoming vacation I can actually spend time on my book 🙂 Are we in the same boat??? That’s awesome! We should give our boat a cool name … like the HMS Chimera. People are illogical all the time. Look no futher than writers! Good luck on your rewrites and advanced congratulations on those unexpected moments of insight that will hit you as you write that improve your manuscript. Thanks 🙂 Unexpected insights are the absolute best. I can’t wait!!! You forgot Step 15: Dance on the smoldering graves of my enemies as my invincible army of giant robots drives the world to its knees. So far in my planning for “The Worms Of Heaven” I have determined that a) Ex is not going to die in this book, and b) at some point Agony is going to bake zucchini bread. Those are both suggestions from my sister, and I think they are good ones. Yay for Ex not dying! I liked him. And you should absolutely work zucchini bread into your plot. I don’t see Agony as being a very good baker, for some reason … maybe because I equate baking with empathy for some bizarre reason, and Agony’s kind of like super cold-hearted. If that scene does make it in, it would be a fascinating read! Oh goodness. I mean … you know what I meant!!! Audio books? That sounds fun! I know Misha Burnett has been doing some audio book related activities recently. Apparently some voice actors will actually let you pay them in book royalty sales, rather than an upfront fee. Definitely something to look into!